Soak the dried mushrooms in 1 cup of boiling water for half an hour. Strain, reserving the soaking liquid. Chop the soaked mushrooms into small pieces and set aside. Melt the butter with the olive oil in a large saucepan over medium heat. Add the onion and sauté until soft. Add the button mushrooms and sauté until browned. Add the chopped wild mushrooms, ¾ cup of the reserved soaking liquid and the Madeira or Sherry. Simmer for a little while, until mixture reduces slightly. Add the cream, salt and pepper. Stir and simmer gently until gnocchi is ready. Meanwhile, cook gnocchi according to package directions. Place a large pan over medium high heat and coat with a little olive oil. When they float to the surface, spoon gnocchi into the hot pan. Stir to crisp up the edges. 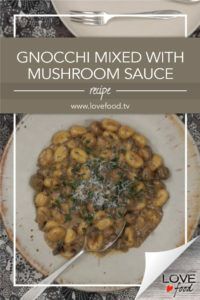 Tip gnocchi onto a serving platter, top with mushroom sauce and garnish with parsley and parmesan cheese.